"The officer also had to deal with the desperate and panicked victim who was pulling him down, putting both their lives in danger." Lieutenant Rahul Dalal of the Indian Navy saved Dileep Kumar from drowning. Lieutenant Rahul Dalal of the Indian Navy helped avert a tragedy when he rescued a drowning man in Kerala and managed to resuscitate him. 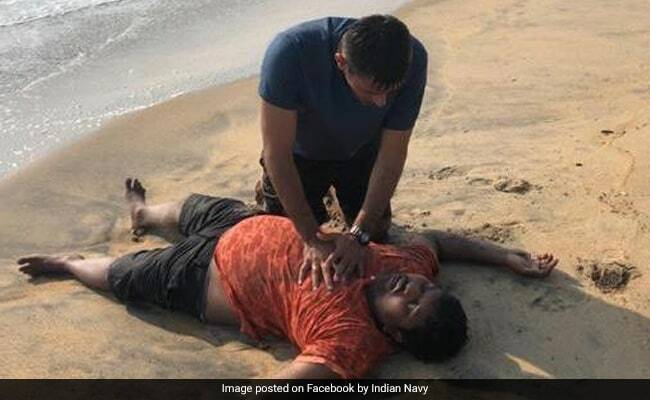 According to a social media post by the Indian Navy, the incident took place on Friday when Lt Dalal went to the Vypin beach in Kerala with his wife. At around 4.10 pm, he noticed a man struggling in the water, unable to swim and trying to shout for help. Though there were other people at the beach, nobody was able to help the victim - identified as Aurangabad resident Dileep Kumar. Noticing the incident unfolding before him, Lt Dalal, without any hesitation, went to rescue the drowning man. According to the Indian Navy, though he managed to reach Mr Kumar in just a few minutes, it took much longer to swim back with him. "The officer also had to deal with the desperate and panicked victim who was pulling him down, putting both their lives in danger. The officer calmed the victim and made him hold onto his shoulders, after which he started swimming towards the beach," said the navy in its post. Once he managed to reach the shore, Lt Dalal had to deal with another obstacle as the victim was unconscious and not breathing. "When his mouth was opened, it was found that some plants were choking his air passage. Lt Dalal cleared the passage and administered Cardio Pulmonary Resuscitation, whereupon the victim was revived," said the navy, sharing two pictures of Lt Dalal helping the victim. Since being shared online, the post has gone massively viral online, collecting over 21,000 'likes' in just over an hour on Instagram alone. On Facebook, it has also collected hundreds of impressed comments. "Great job Lt Dalal. Really proud of you, hats off to you," wrote one person in the comments section. "A soldier is never off duty," another praised. "That's a spectacular save ... Well done job," a third said. The victim Dileep Kumar was taken to a hospital from where he was discharged after recuperating.